Many reference resources state that the first large-scale digital program-controlled computer was the Harvard Mark 1, which was developed by Howard H. Aiken (and team) in the United States in 1944. However, today it is widely accepted that a program controlled computer called the Z3 had been completed by Konrad Zuse in Germany in 1941, which means that the Z3 pre-dated the Harvard Mark I. Maybe the main cause that Konrad’s machines were not counted in the "official" history of computers (except in Germany) is the fact that he was on the wrong side of the WW II. Although based on relays, the Z3 was very sophisticated for its time; for example, it utilized the binary number system and could perform floating-point arithmetic which could be used for complicated arithmetic calculations. Konrad Zuse (1910-1995) also developed the first real programming language, Plankalkül (“Plan Calculus”) in 1944–45. Zuse's language allowed for the creation of procedures (stored chunks of code that could be invoked repeatedly to perform routine and subroutine operations such as taking a square root, and structured data (such as a record in a database, with a mixture of alphabetic and numeric data representing, for instance, name, address, and birth date). In addition, it provided conditional statements that could modify program execution, as well as repeat, or loop, statements that would cause a marked block of statements or a subroutine to be repeated a specified number of times or for as long as some condition held. Zuse was an amazing man who was years ahead of his time. To fully appreciate his achievements, it is necessary to understand that his background was in construction and civil engineering - not electronics. The basic mechanical relay is an electromagnet that when activated, by attraction, opens or closes one or many sets of contacts. Konrad used relays to built logic gates - an arrangement of electronically-controlled switches used to calculate operations in Boolean algebra. Logic gates can also be constructed from diodes, fluidics, optical and mechanical elements. However, modern digital computers are built almost entirely from transistorized versions of these logic gates. Nikola Tesla filed the first patent for the AND logic gate in July 1900. The general idea behind an AND gate is: If A AND B (both) take the logic value "1", then Q will be also "1", otherwise Q will take the logic value "0". This behavior is detailed in the truth table for the AND gate above. The same applies to the relay AND gate shown above: If we apply, both, A AND B points 6V, then Q will be 6V (otherwise Q will be 0V). This happens because when we apply 6V to both A and B, both relays R1 and R2 are activated and both contacts, which are connected in series, are closed and Q gets 6V. In other words, in a relay gate (or a transistorized one) the 1's and 0's are replaced by two different voltage values, in our case 6V and 0V (ground) respectively (other voltage values are also possible). 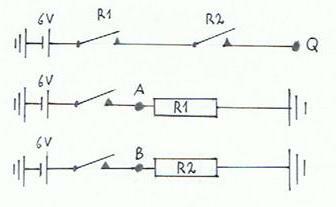 In the same way we can also build an OR relay logic gate, but with one modification, instead of the two relay contacts being connected in series, like the case of the AND gate, the contacts will be connected in parallel. The same explanation applies to other logic gates (though different truth tables) - NOT, XOR, NOR, NAND which all of them could be build from relays. For beginners: Build from relays common logic gates and demonstrate their truth tables with LEDs or suitable bulbs connected at the input and output. For advanced students: Construct from relay logic gates half or full adders and demonstrate their truth tables. Adders are central components in any modern computer's ALU (Arithmetic Logic Unit - the main part of CPU). Build from relays alarms, counters etc. The story of Konrad Zuse and his revolutionary invention - the computer (or mechanical brain as he liked to call it), which Zuse built in his parents' living room. 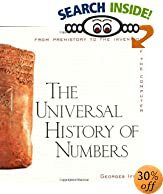 A riveting history of counting and calculating from the time of the cave dwellers to the late twentieth century.